Android and all other writing has been transition over to fregrott.wordpress.com. Please change your bookmarks. So if you consume the rss as individual feed put into your rss reader now. I have been sifting through Chicago Android opportunities and wanted to share this little strange gem. I am keeping the firm name and person’s name undisclosed because it would somewhat be embarrassing to them but to say that this proves that the people who cannot code go into business management somewhat is an understatement. Basically, we were discussing what the first steps of android developer executes in a new position and I brought up the fact that one obviously creates a utility library full of helper classes and UI widgets. The interviewer stated tha they do not do that as they want some UI widgets created via code and not xml. Now guess what basic java concept the interviewer does not get, and this folks is former java programmer doing the interviewing? Well, by using method overriding one can have methods that create the UI widget via code and by xml in the same class. 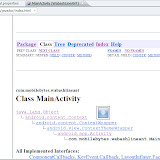 Not to mention that you can include such classes in an Android Project Library. Or even this gem of not understanding that the basic rule of not having non-UI stuff on UI threads all leads into why the Android Activity/Application life-cycle is the way it is as far as the difference between the Application context and the activity context. Its interesting to go on interviews to see if people really get testing or not and its role in the agile process. For example, the set of ant-rules files that is distributed with the android sdk has had annoying little mistakes in key areas such as the coverage target inn test_rules, etc for awhile. My correction to the coverage target is in this Gist. And those little mistakes are usually encountered by just executing the scripts and going through all the developer user cases…in other words functional testing of the ant scripts. Its the same testing of patience when you participate in interviews and receive the impression that the potential firm is not using testing. If you are an android bug reporter please vote for the bug, issue 17305. Lets vote on enough of these bugs in the ant rules files included with the sdk that the ant scripts become extremely useful instead of half baked. I did find a code coverage tool that works with robolectric. Its called undercover and is hosted at googlecode. The dependencies and ant task directions are here. Seems like everyone did not get why Google choose not to demo Social at Google IO this year. Obviously, part of it is that they do not want any other parts distracting it. But, the other part i believe is some focusing on what is coming for Android for rest of 2011. While we already know that GoogleTV Android Sdk addon is coming there are of course other items that have only been hinted at with brief one sentence paragraphs. For example, the music store hinted at GoogleIO 2010 is somewhat late as it was slated for holidays 2010. However, the Android Market changes to pave the way for that in terms of better access, in-app payments,etc have been incorpoated into Android Market. With Apple testing over-the-air iOS updates slated for full implementation possibly in iPhone 5 that means apple will have the means to attack the low-end as before that style of updating you had to have access to a desktop mac to do updates. This means Google and OHA has to offer something beyond the navigation and text to voice. That obviously could be finishing the UI/OS fragmentation work of moving everyone to the Honeycomb UI apis including OEMs as that would result in OEMs getting updates to mobile carriers in terms of weeks rather than months. Thus, that is something to look for in does Google show off an Android 2011 road-map or show a new version of android for phones with the new honeycomb UI apis being used. But, no matter if those get fully addressed or not it should be an interesting Google IO.